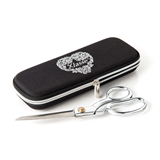 8.5in / 21cm high quality Dressmaking Scissors. 2.5mm thick stainless steel blade for long lasting performance. Presented in a protective zip case.